Kasper's book is the first to explain the why, not just the how, in the valuation of privately held businesses, and as such makes a unique contribution to its field. Among its many points, the book makes clear that there is no small stock premium, current valuation practice produces business valuations that are too subjective, and tax precedents and laws do not govern business valuations for other purposes. A truly multidisciplinary approach to the advanced study of valuation theory and practice, the book critically examines the many common practices and assumptions accepted by certain appraisers and finds them wanting. It is thus an in-depth exploration of the foundation of current valuation practice, and the evidence that supposedly supports or refutes traditional wisdom. 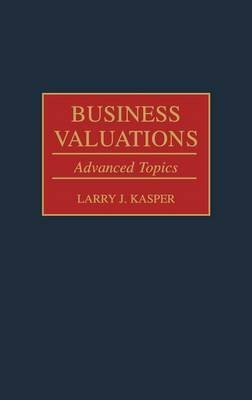 With easily grasped numerical examples and case studies from Kasper's wide professional experience, this work is an important source of information, knowledge, and applications for professional and academics alike, not only in accounting and related fields, but also in management, investment, and law. Kasper begins with a discussion of the most quoted authority in business valuation, Revenue Ruling 59-60. For attorneys, this is probably the single richest source of cross examination material available (and the ruling appears in its entirety in the Appendix). Although Kasper concentrates on developing the conceptual foundations of valuation, he also explores more practical matters and their meanings, such as fair market values, valuations for tax purposes, and trial strategy. Kasper points out that some of the conclusions he offers are controversial, but if the logic underlying them is understood, their truth will soon be apparent. He also argues convincingly that theory is not just for academics, but can be a useful tool to understand how the real world works--and why it often fails.